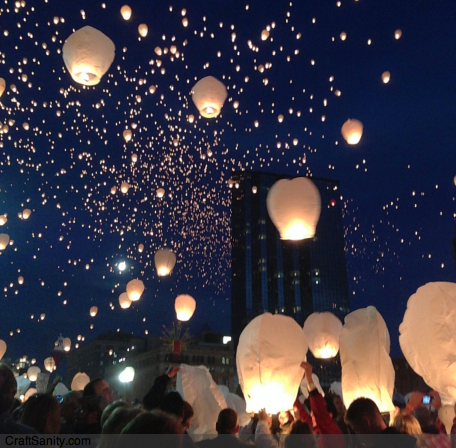 Thousands of paper lanterns were released into the night sky Friday in downtown Grand Rapids as part of ArtPrize 2012. The entry, by Mark Carpenter and Dan Johnson, resulted in a stunning visual display of flickering lights climbing high above the city and thousands of smiles on the ground. It was lovely. After a very stressful couple of weeks, it was nice to witness something beautiful. It served as a reminder that I really have to stop grabbing ahold of the safety lines in my life and just let go and see what happens when I dedicate my time and energy fully to a project of my own design. During the last three years, I’ve continued to bog myself down with low-paying and unpaid work for other people, and that continues to steal valuable time and energy away from the things I feel most compelled to do. This has to stop. Seeing those lanterns floating in the sky inspired me to consider what could be if I rearrange my priorities and put my own projects at the top of my professional list as opposed to fitting them in when I’m exhausted and all my work for other people is done. My latest attempt to “give back to the world” is kicking my rear. I’m working hard and failing to motivate everyone in the room. I don’t accept or understand apathy and laziness and now the stress and disappointment of it all has showed up on my face in the form of acne – a problem I don’t normally contend with. At the height of it, I had a headache for a solid week and I was walking around with an uncomfortable tightness in my chest. I thought the headache was from getting hit in the back of the head with a soccer ball (when it rains it pours, eh? ), but now I’m thinking that may of been a coincidence. Stress is physical and my body is telling me something. I just hope I’m smart enough to listen. Perhaps, when I get to the next crossroad and have the opportunity to change direction, I’ll make like a paper lantern and take off on a new and beautiful adventure.